Smart lights are a natural starting point for setting up a smart home, especially if you’re DIY’ing it. Whether you want the lights to turn on before you get home, or if you’re always forgetting to turn them off in the morning rush, swapping out regular bulbs for the likes of Philips Hue, LIFX, or GE Link can make lighting your home easier than ever. Follow along for info on setting up and using these different bulbs to find the right one for your home. 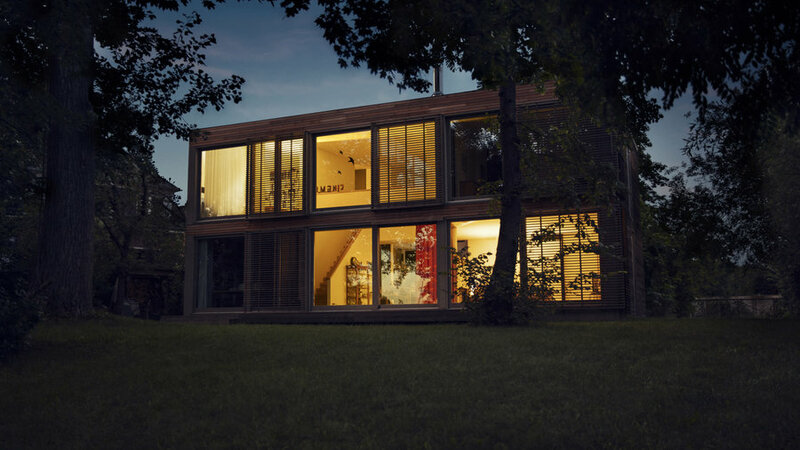 One of the most recognized smart light bulbs is Philips Hue. While Hue’s bulbs are easy to use, the downside is set-up. Hue requires a hub, the Philips Hue Bridge 2.0, which comes on its own ($60) or in one of the Philips Hue starter kits (from $70). You’ll need to hook up the hub to your router, and then press the center button each time you install a new lightbulb. 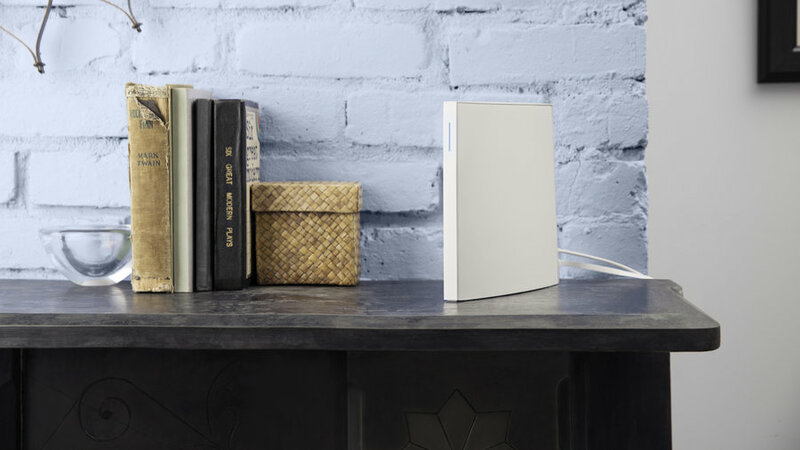 If your router is in a tricky location, the process might require a second pair of hands, making it a bit of a pain. But besides that, the bulbs can be easily swapped in for regular ones, and hooking up the bulb to the hub and app takes just a few minutes. 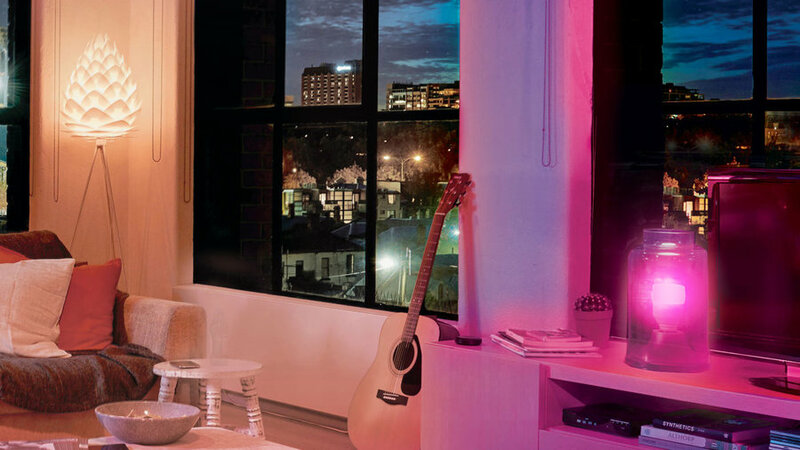 Once you’re set up, the Philips Hue experience is one of the best. 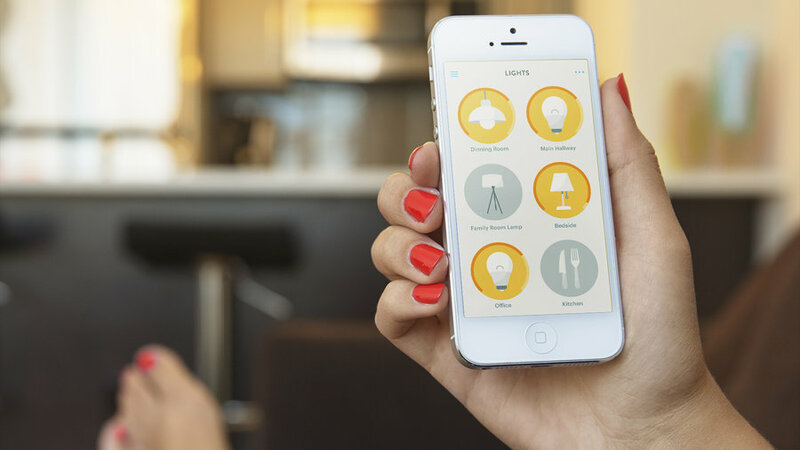 The app allows you to easily organize your lights by room, and has a page dedicated to creating routines. The routines reflect when you typically leave and return home, wake up in the morning, and go to bed, so the app can respond accordingly. 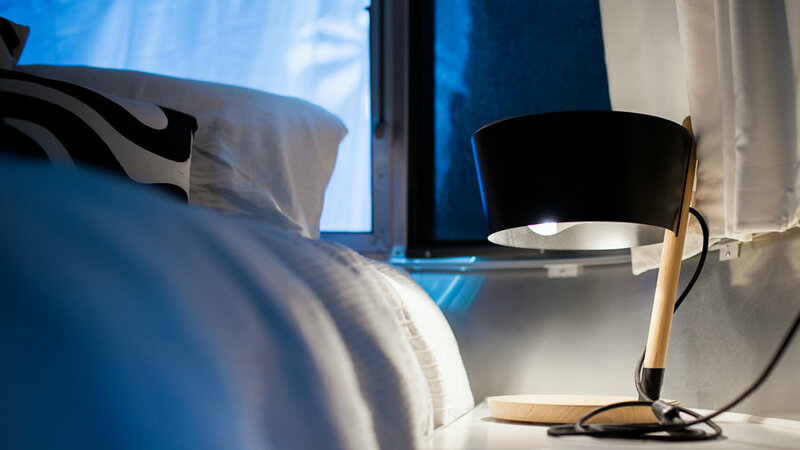 Using your location or the time, the app automates your home lighting, from dimming just before bedtime to having them on as you walk in the door. Hue’s app also comes preloaded with numerous light scenes, ranging from warm reading lights to “Tropical twilight” that turns the room of choice into a sea of pinks and oranges. These also immediately load onto Alexa when you connect your Hues, making it easy to voice-command any colors or mood lighting you want, as long as you remember the name Hue (or you) gave the scene. The lights also have a really soft transition between colors, and each light turns on one at a time when you voice-command a setting, making the overall experience gently beautiful. 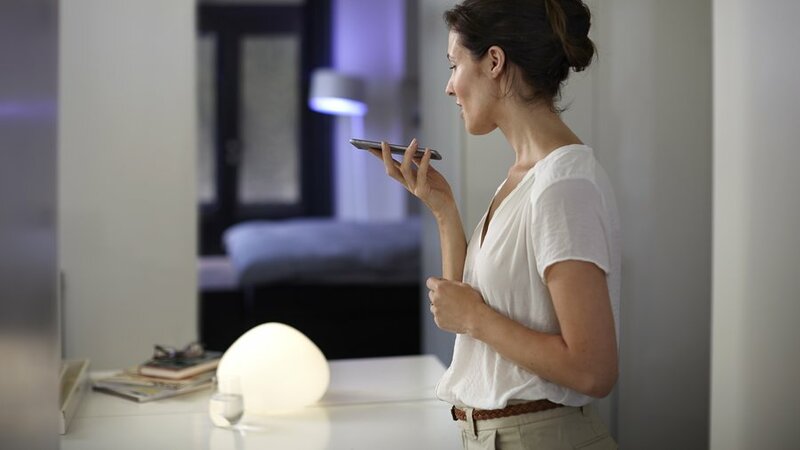 Philips Hue is compatible with nearly any smart home system—Amazon Echo, Siri Homekit, Nest, and even other light bulbs. If you’re on an iPhone, the app will have you set up Hue with Homekit automatically. However, Echo set-up is also speedy: Make sure to activate the Hue skill first, and then search for devices on the Echo app Smart Home tab--though it does require pushing the button on that pesky hub again. Speaking of which, you’ll have to push that button whenever you pair Hues with other hubs, like the Wink 2. After that, you can easily control your Hue in conjunction with any other product you have connected to your voice assistant or second hub. The great thing that differentiates LIFX (from $60 single bulb, $100 for starter pack) from all other smart bulbs is there’s no hub to be found. Just screw in the bulb and open up the app to get started. It’ll take a few minutes to get started within the app, but it has the removed hassle of setting up yet another device. However, since there isn’t a hub, if you accidentally turn off the light switch instead of using the app or controlling it through a smart speaker, you’ll find the bulbs have disconnected from your phone and you’ll have to reconnect them. The LIFX app itself is fairly straightforward. As you set up each bulb, you assign it to a room and then control the bulbs accordingly. Play around with light settings and you can instantly create and save a “scene” once you have it set up in a way you like. You can also select a light or group of lights and choose from preloaded themes (e.g. “Santa” has red and white lights, while “Energizing” is blue lights) and effects (e.g. music visualizer, candle flicker) in the app. 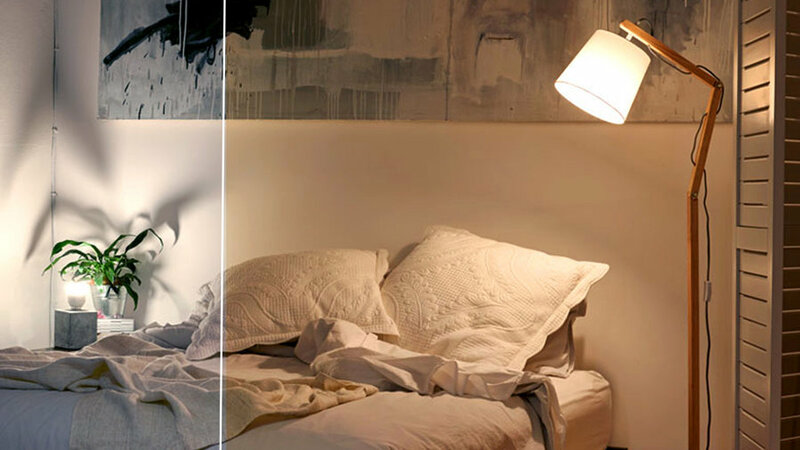 LIFX bulbs stay nicely in sync when you’re changing the lighting colors of the room, but the transitions between colors can be a little harsh on the eyes. 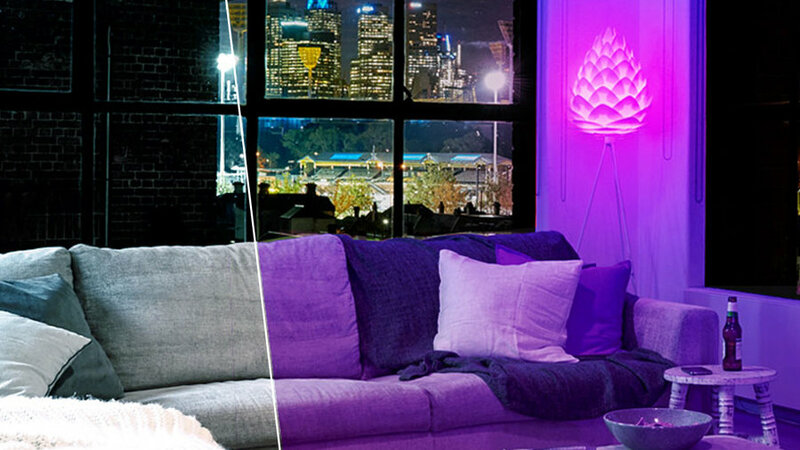 LIFX, similar to Hue, works with a lot of other devices, like Amazon Echo, Logitech, and Samsung SmartThings, but Hue has a much larger range. LIFX currently doesn’t have native Google Home support, but it’s still possible to connect them through IFTTT. If you’re an Alexa user, set-up happens immediately. Again, you’ll need to activate the LIFX skill in the Echo app before searching for devices in Echo’s Smart Home area. General Electric also has a set of smart lights called the GE Link ($15). These bulbs are connected through a hub called the Wink Hub 2 ($99), which has a similar set-up to the Philips Hue but without the (slightly inconvenient) button in the middle. Bonus points for being one of the prettiest hubs available, and the ability to use WiFi so you don’t have to anchor it to wherever your router is hidden. These lightbulbs are a solid choice if you don’t need any rainbow hues in your home, and prefer a more affordable price tag. They’re white hue only, meaning you’ll only be able to dim or brighten your lights, rather than go from warm reading light to a blue and pink tropical experience. But if that’s not of interest, these bulbs remove those extra bells and whistles from the equation and give you a simple bulb that you can control from anywhere. GE Link is powered by the Wink system and hub, which can connect to much more besides the GE bulbs, making it a great choice if you’re looking for a central hub (that isn’t a speaker) to control your home. 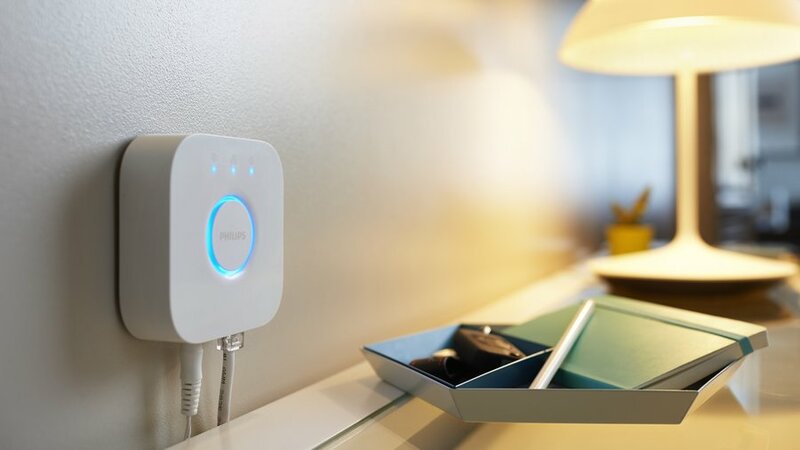 You can connect both GE bulbs and Philips Hue bulbs (though the Hue still needs its original hub too), Amazon Echo, various Nest products, smart locks like August, and more to Wink. Then, you can use the Wink Hub 2 with all those connected products to create two things: Shortcuts and Robots. Shortcuts are quick general home automation settings that you can create and select to have easily happen (e.g. a shortcut to turn everything off) once you choose that shortcut in the app. Robots are similar, but act on their own instead of you selecting it in the app. You preset the triggers for the Robots, like when the clock hits 7p.m. turn on all the lights, or turn on cameras when you walk past the front door sensor.